I’m not shy in my advocacy for exercise as a therapy for mental health. It’s something I talk about often, something I’ve experienced first-hand, a topic I’m passionate about, and over the past few years, something I’ve continued to research and strived to understand better. This is what I’ve learnt – the human brain is fascinating and we’re continuing to discover more about its capabilities every day. We certainly don’t know all there is to understand about the connection between physical exercise and mental health, but I hope you’ll agree, moving our body is something our brain wants and something our mind can hugely benefit from. Here’s just some of the reasons why. Most of us will have heard of endorphins – the ultimate “feel good” chemicals that our body releases when we exercise. Endorphins are what we can thank for that blissful ‘post-exercise high’ that often follows a good sweat session. These chemicals interact with the receptors in our brain that reduce our perception of pain and trigger a positive feeling in the body. Endorphins help to reduce stress and anxiety, but when we exercise, there are other mood boosting chemicals at play as well. Exercise also increases the production of serotonin in the brain, which works as a natural antidepressant. Lastly but certainly not least important, exercise increases the production of dopamine – the “motivation” and “reward” brain chemical. With a knock-on production of endorphins, serotonin and dopamine, it’s no surprise regular exercise is linked with enhanced mental health and emotional wellbeing! Research supports the idea that exercise improves focus, attention, and the ability to concentrate. But how? When we exercise, especially at a high-intensity where our heart rate is elevated, our adrenal glands and our brain ramp up production of a chemical called norepinephrine. As more norepinephrine flows into our bloodstream, it increases our alertness and focus. An important reason to prioritise exercise during busy working periods, to improve productivity! A number of studies show that aerobic exercise (aka cardio) promotes brain growth, especially in the hippocampus area, the part of our brain that is associated with memory1,2,3. And if that‘s not enough to convince you – a new study from McMaster University in Canada found that young adults who participated in 6 weeks of high intensity interval training (HIIT) experienced significant improvements in their memory and recall4. Keeping physically fit can also help to keep our brain healthy as we age. Exercise stimulates the release of growth factors, chemicals in the brain that affect the health of brain cells, the growth of new blood vessels in the brain, and even the survival of new brain cells. These growth factors help to protect our brain against injury and preserve our cognitive function5,6. 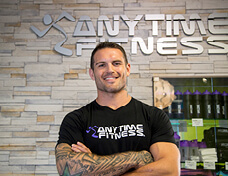 Dan Conn is a former NRL player and one of Australia’s most recognised health and fitness professionals. In 2017, Dan joined Collective Wellness Group (CWG) in the role of Wellness Director. This newly created position was designed to educate Australians around CWG’s ethos, prioritising mental health and recovery alongside a physical fitness routine. Dan’s role as Wellness Director sees him developing healthy body and mind initiatives across each of the CWG brands and visiting clubs to educate, train and support franchisees, coaches and members at a community level.